Visiting WSU’s Knott Dairy Center, animal scientist Amber Adams Progar is helping launch a statewide Dairy Safety Network this spring, helping dairy farmers and employees prevent costly injuries. For employees of Northwest dairies, sharing close quarters with a one-ton dairy cow requires knowledge and awareness to avoid preventable injuries. One slip could mean a crushed finger, broken bones, or worse, as well as thousands of dollars in lost productivity and higher insurance premiums for farms. Protecting people, farm businesses, and animals, Amber Adams Progar, assistant professor with Washington State University’s Department of Animal Sciences, has partnered with dairy farmers and researchers across Washington to help farmers and their employees master safer farm practices and cow-handling techniques. This spring, Adams Progar is helping launch the new Washington State Dairy Safety Network, a collaboration between the Washington State Dairy Federation, WSU and the University of Washington’s Pacific Northwest Agricultural Safety and Health Center. Funded by the Washington State Department of Labor and Industries’ Safety & Health Investment Projects Grant Program, the new network will create and share safety training and knowledge that helps dairy employees stay safe on the job. 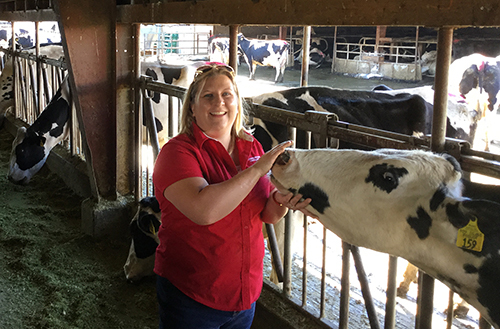 At WSU, Adams Progar and her students study stress in dairy cattle with an eye on improved management practices, helping boost animal well-being and farm performance. In its 18-month project, the Dairy Safety Network partners are developing an online, interactive resource for dairy safety knowledge and training materials, ensuring that farmers, managers, and employees can find needed information in English and Spanish. This year, Adams Progar will develop a “Train the Trainer” program, researching common animal-related injuries, such as crushed fingers, and building training sessions that help farmers prevent them from happening. This program will also be offered in English and Spanish. Last month, Adams Progar and her collaborators offered the Network’s first outreach event, a safety workshop at the 15th annual Agriculture Safety Day in Kennewick, Wash., helping farm managers and employees prevent slips, trips, falls and animal‑related injuries. Learn more about Adams Progar’s research here.